Our only child, Benjamin Christopher, celebrated a birthday on the 10th of August. The 35th one. Hard to imagine my cute little boy being so old ... or is it that I can't imagine me being so old to have a son that is 35? Regardless, he had a good one. 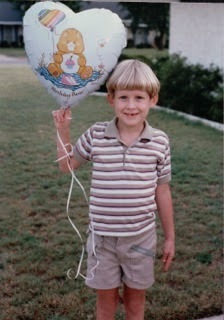 When he was younger we would get a balloon to release into the heavens for his Nana and Granddaddy. They died when he was 6 years old and it became a tradition to do that. He would kneel down and pray and then let it fly. We would stand and watch until it became invisible. Sweet memories. My husband and I were having lunch one day and heard a sound we'd never heard before and it was repetitive. I said it's probably a fawn since I saw two of them playing back there today. Fawns from different mothers will often play together since the mothers sometimes browse together. A few months back we had a fawn right at our screened porch letting out this bleating sound that made it sound like a goat. Different from the sound we heard at lunch recently, so I thought I'd see what sounds they do make. Upon Googling for this, I came across this delightful video of a herd of deer that frequented a home and property daily since they had a lot of clover. The deer, both mom and fawns, were very vocal when trying to find each other. They would rest in the yard and over the years even allow the people to sit near them and touch them. 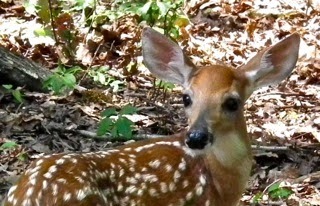 View YouTube video on deer and fawns. I've seen videos where people feed deer, even on plates at a picnic table. I didn't see any of that here which I don't agree with. "Our" deer occasionally get corn or sunflower seeds because we put some down weekly as a treat for the squirrels and ground birds like the doves. If the deer come by while there's still some left they eat some, but that's not less "wild" than happening upon anything else to browse on. The location of the corn is also changed quite a bit and some is placed under bushes or concrete benches so the deer can't access it easily. We've had a lot of damselflies and dragonflies this year. We have a backyard frog pond and they get to visit and produce their offspring in it also. It's amazing what all will come and live in a small backyard pond. We love frogs so that was our motivation for digging it, but I also love some of the pond plants that have beautiful blooms. 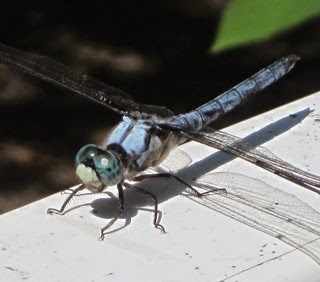 This dragonfly in the enlarged view looks like he's got huge front teeth. Haven't noticed this before so wondering if it's something he's in the process of eating. Anybody have any comments? We live in a small enough house that my husband and I can simply shout back and forth with questions or reminders about something. Lately it seemed that I was repeating everything I said to him, so I wondered if there was a hearing test that could be done online. There is a test and it was fun and simple to take. It seems hearing isn't an issue as much as "tuning in" on what's being said. 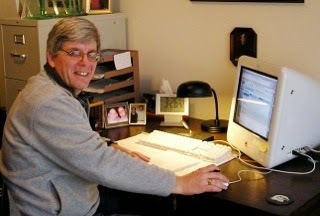 Randal works all day on the computer with programming code and some complicated tasks (in my mind anyway), so he's just processing some bit or byte of information when I begin to speak and doesn't "tune in" as quickly, so that's why he keeps asking me to repeat everything. Want to take the hearing test? A newsworthy tip: IRS recently renewed its Oct. 2013 warning about a pervasive phone scam that continues to target people across the nation, including recent immigrants. The Treasury Inspector General for Tax Administration called it the largest scam of its kind. As of March 20, TIGTA reported that it has received reports of over 20,000 contacts related to this scam. TIGTA also stated that thousands of victims have paid over $1 million to fraudsters claiming to be from the IRS. Read the article. The Green-headed Coneflowers are in full bloom to the delight of all the pollinators and the American Goldfinches that love the seeds. Now that I'm back to garden work I am feeling more complete. When all I could do was look through the windows or sit on the porches longing to be walking in it ... making mental lists of all the things that needed to be done ... and feeling so deprived of "being me" ... I was not a happy camper. However, at all times I realized the blessing of having such a place to view, even if I could not step into it. It offered much solace and comfort. Not only watching things grow and bloom, but the wildlife that it attracts which is the most delightful entertainment there is for me. I'm not a city gal any more. As many young people do, I enjoyed living in the big city of Atlanta that offered everything under the sun to do, but when we built our first home in an acre and a half of woods, I began to fall in love with God's Creation and nothing competes with the thrill of that now. Rachel Carson said in The Sense of Wonder, “There is something infinitely healing in the repeated refrains of nature - the assurance that dawn comes after night, and spring after the winter.” It has seen me through many a sorrow or grief or loss by making me so aware of the closeness of Jesus when we are hurting. You can create a garden wonderland even on a small balcony. The visual delights will carry you away to peaceful places where your spirit and soul can refresh and be made whole again. Some things that I find in the garden are not an exciting adventure. These guys are stink bugs and if you've read anything about them, they are causing a lot of trouble in the agricultural world (read more about this). These bugs can become a nuisance pest for homeowners when they are attracted to the outside of houses on warm fall days in search of protected, overwintering sites. They find their way inside and in Spring as the weather warms they begin emerging and you can find stink bugs all over your home. We have had some on our screened porch, but fortunately not in the house. 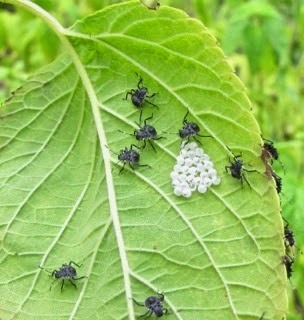 If you find something that looks like these eggs, do not assume they are stink bugs. Many insects lay down this style of eggs and they can be beneficial like the Green Mantidfly that laid eggs last year on the front porch lamp. I mentioned this with photo in the 8/1/14 newsletter with information about the benefits of the Green Mantidfly. This is not the first sighting of Stink Bugs on our property. We've had them for years but we rarely see any now. There are a variety of Stink Bugs. View photos of all that I've discovered on our property. The only ones I've seen this year were 3 that appeared on the screened porch. We have a large area of these salvia plants and I did not see any other leaves affected other than this one, so we will let nature balance itself out since so few will surely be eaten especially since we still have Mamas and Papas feeding their babies. They aren't increasing in numbers at all. Matter of fact the first year I saw them they were all over the butterfly bush and other plants. We decided then to wait and see. Seems we've done that. 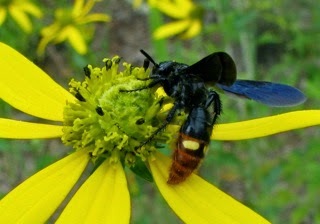 Somebody is eating them up just like the Japanese Beetles we used to have in large numbers. Read about our disappearing Japanese Beetles. Last Saturday we decided to take a day trip to Farmville, VA. The town is mainly known for being a furniture outlet, but there is a lot of history there also. Lots of cool architecture and information on historic areas in downtown Farmville. 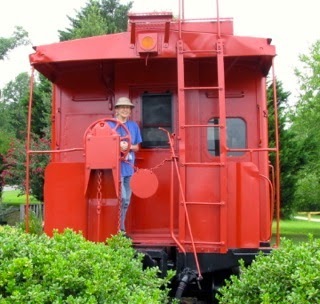 There was a train station and a bright red caboose which I loved. I used to climb all over and inside cabooses when I was a kid. My great grandfather would take me down to the train tracks to do so. Anytime I see a caboose I can climb up on ... I'm on it! We walked the Sarah Terry Trail at Wilck's Lake, visted Longwood University and Hampden-Sydney College and even took a step back in time having lunch at Walker's Diner. View photo albums at above links. If we have family problems with children or relatives, we must speak blessings over them so God can work a change in both hearts. 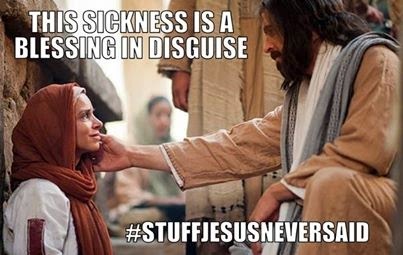 If you are seeking healing, don't look at the problem, look to what the Word tells us about healing (by His stripes you WERE healed). Jesus told us that in this world we would always have troubles, but that He has overcome them. 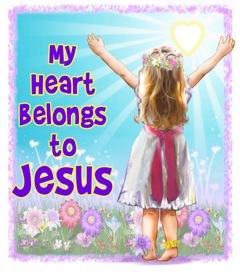 He came to give us life abundantly. He did the suffering for us. There are Bible promises to release you from every problem you may have, but they must be voice-activated. Just as God created the entire universe by His words, we have the same power within us to speak "to the mountain" as Jesus said (Matthew 21:21), and deliver ourselves from the problem. We are told to meditate on the Word. Chewing, absorbing and sinking it into our hearts. Quantity Bible reading is not the best way to approach the Word. Biblical meditation is focused thinking about a Bible verse that speaks to you, so you can more effectively apply its truth to your life. True application of the Bible in your life requires Biblical mediation. God's love for us is inescapable, insurmountable and irrefutable. We are simply awesome. If you're not certain of this, just ask our Dad! Begin to recognize that God loves you so much! Speak to yourself in the mirror if you have a hard time believing this. Speak blessings over yourself and your family. Choose to take time to be with the Lord and ask Him what Bible verse will help you get through the challenging situation you have now. Then choose to meditate on that verse until you believe it to be true in your heart ... not just your head. Have a blessed time with the Lord this week. Be still and know Him!